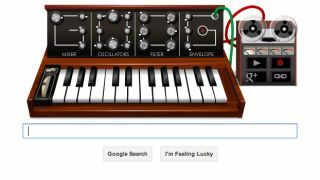 Bad news if you had anything planned for this morning: there's a playable synthesiser on the Google home page. The doodle is to celebrate music pioneer Robert Moog's 78th birthday. Click on the keys and you can make sounds. Then twiddle with the knobs above to tweak the filters, oscillators, and even alter the pitch with the disc on the left. Press the red record button on the side and you can even store your creations for playback later. Though you might want to practice a little first. Moog introduced the synthesiser in the 1960s. While synths already existed, he revolutionised the instrument by adding a small keyboard so anyone could play just by hitting the keys. Bands like the Doors and the Beatles used the Moog synth. Moog's name is still synonymous with the electronic sound, and the instrument is still widely used. Moog was tinkering with electronics from a young age. He built a theremin - another electronic instrument - when he was just 14. With the help of his father, he started selling theremin kits by mail order in 1954. The New Yorker studied at the Bronx High School of Science, then Queen's College. He studied electrical engineering at Columbia University, earning a doctorate in engineering physics at Cornell. Speaking about his most famous creation, Moog said: "I didn't know what the hell I was doing. I was doing this thing to have a good time, then all of a sudden someone's saying to me, 'I'll take one of those and two of that.' That's how I got into business." Moog died in 2005 aged 71 of a brain tumour.